The book represents an ingenious guide on how to achieve peak performance in sales, your career, and life. It is written by 27 exceptional entrepreneurs and sales leaders. 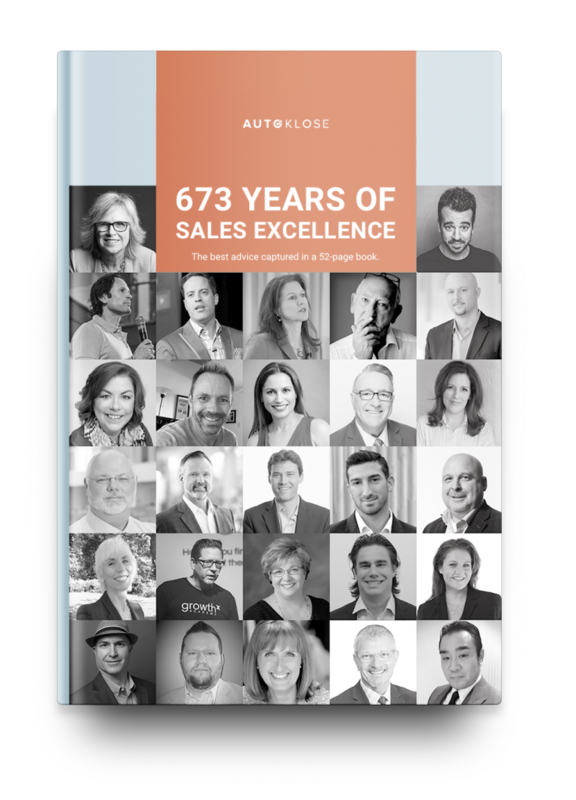 If finding excellence in sales were like climbing to the top of a mountain, we offer you here 673 years of climbing to the top of the sales mountain. You can hike your way up to the summit in 52 pages. Get your free copy here: autoklose.com/books/salesleaders. a. “The Process” chapter represents the most important hard-earned lessons, on the following topics: Sales Development, Negotiation/Closing, and Customer Success. b. “The Career” chapter is profound in its simplicity. “The Career” chapter tells you about our heroes’ North Star or what key ingredients brought success, in their long and fruitful careers. No one has ever achieved greatness solely. Likewise, this book could not have been possible without the community of entrepreneurs, sales professionals, and our own Autoklose team. Working with such enormously talented people made this journey that much more rewarding. We would like to highlight the contributions of a few individuals who over the last few weeks helped us going through hundreds of pages of content gathering key insights, connecting bits and pieces of the puzzle and making this book look gorgeous. Natasa Djalovic — Content Marketing Manager. Aaron Ross, Adrian Chow, Barbara Giamanco, Bob Perkins, Chris Ortolano, Cory Bray, David R Bradley, Dianna Geairn, Dionne Mischler, Jamie Shanks, Jill Konrath, John Barrows, Jonathan Farrington, Kendra Lee, Lars Nilsson, Lauren Bailey, Max Altschuler, Mike Kunkle, Paula White, Richard Harris, Sean Sheppard, Steli Efti, Steve Richard, Steve Shauck, Tamara Schenk, Tibor Shanto, Wendy Weiss. This book is a treasure trove. We hope you find the guidance you are searching for and some new valuable insights as you browse through these pages.